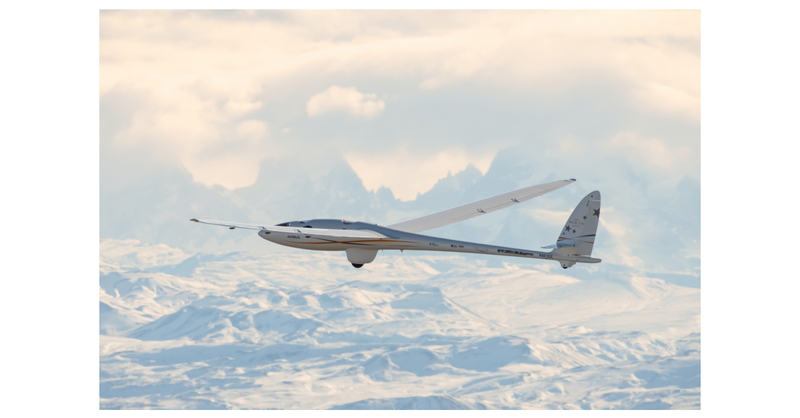 EL CALAFATE, Argentina–(BUSINESS WIRE)–Airbus Perlan Mission II, the world’s first initiative to pilot an engineless aircraft to the edge of space, made history again yesterday in El Calafate, Argentina, by soaring in the stratosphere to a pressure altitude of over 62,000 feet (60,669 feet GPS altitude). This set a new gliding altitude world record, pending official validation. Another first-of-its-kind achievement this year for the Perlan Project was the use of a special high-altitude tow plane rather than a conventional glider tow plane. During yesterday’s flight, Perlan 2 was towed to the base of the stratosphere by a Grob Egrett G520 turboprop, a high- altitude reconnaissance plane that was modified for the task earlier this summer. Operated by AV Experts, LLC, and flown by chief pilot Arne Vasenden, the Egrett released Perlan 2 at around 42,000 feet, the approximate service ceiling of an Airbus A380. An onboard “wave visualization system” that graphically displays areas of rising and sinking air in cockpits. For commercial flights, following lines of rising air would allow faster climbs and save fuel, while also helping aircraft avoid dangerous phenomena such as wind shear and severe downdrafts. An experiment measuring radiation effects at high altitudes, designed by students from Cazenovia Central School & Ashford School in Connecticut. This project is in coordination with Teachers in Space, Inc., a nonprofit educational organization that stimulates student interest in science, technology, engineering and mathematics. A flight data recorder, developed by Argentina’s Instituto de Investigaciones Científicas y Técnicas para la Defensa (CITEDEF). A second flight data recorder, designed by students at Argentina’s La Universidad Tecnológica Nacional (UTN). A space weather (radiation) instrument. An experiment titled “Marshmallows in Space,” developed by the Oregon Museum of Science & Discovery to teach the scientific process to preschoolers. Tune in to live flights of the Perlan 2 on the Airbus Perlan Mission II Virtual Cockpit at http://bit.ly/VirtualPerlan2. Stay updated on flight schedules by following The Perlan Project on Twitter @PerlanProject and on Facebook at www.facebook.com/perlanproject. For more information about Airbus Perlan Mission II, please go to www.perlanproject.org. Want a heads up on the next flight? Sign up by email at PerlanProject.org/contact or if In the U.S. text “Perlan” to 57682. Airbus Perlan Mission II is an initiative to fly an engineless glider to the edge of space, higher than any other winged aircraft has operated in level, controlled flight, to open up a world of new discoveries related to high- altitude flight, weather and climate change. This historic endeavor is the culmination of decades of research and engineering innovation, and the work of a tireless international team of aviators and scientists who volunteer their time and expertise for the non-profit Perlan Project. The project is supported by Airbus and a group of other sponsors that includes Dennis Tito, Weather Extreme Ltd., United Technologies and BRS Aerospace.